Like the title says ~ A picture paints a thousand words ~ so I will keep the text brief on this post and let the photos tell the story. This series of photos show the transformation of my craft space. It has been years in the making but I think I am finally at the point where I am happy to just let natural progression decluttering take over from here. That is, things will now leave as I use them up and not be replaced. So without further adieu please enjoy the photos. These photos show some decluttering in action. I usually don't make this kind of mess while decluttering but the area needed some serious reshuffling so that is what is happening here. And this is the end result of years of progressive decluttering. What do you think of that? 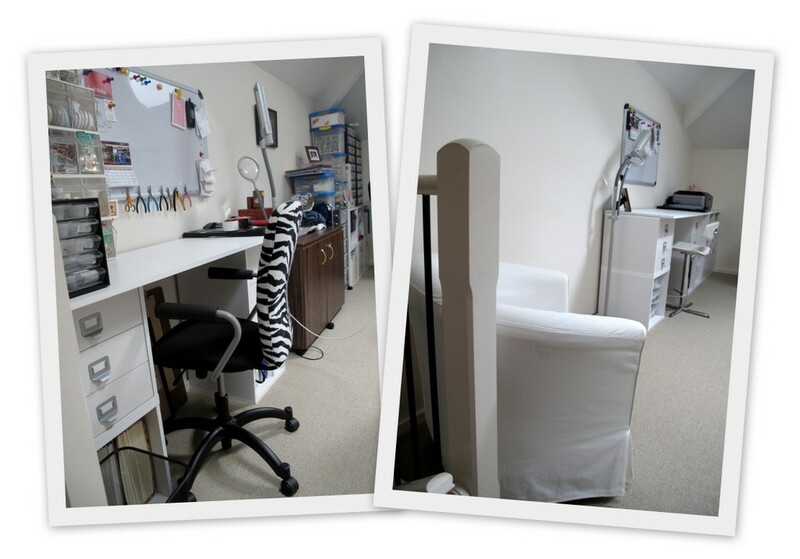 And here is a side by side comparison of the before and after of the same space. Even I am stunned at the difference and I have lived through the changes. Do you have too many accessories ~ Belts, bags, scarves, hats, hair adornments…? If so now is the time to weed out a few. 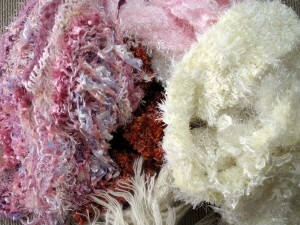 Today I am decluttering a bunch of scarves. Quite often one doesn’t know how items will suit until they are worn for a while. These scarves, some made by my loving, caring mother, made me itch and/or sneeze or moulted all over my jackets so they are off to the thrift shop. I will know better next time. Hot cups of tea on cold days. Actually I love hot cups on tea any day but especially on cold ones. here I am. Still impressed, but found my voice again. Pictures are really showing so much more. 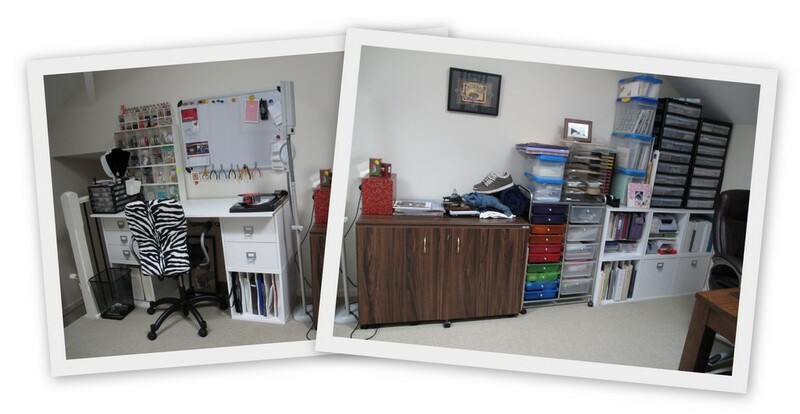 its visible how much you culled and decluttered. that is amazing. I love the place you created. the brown picture frame that was there all the time is now an eye catcher. before it was just part of the clutter and not visible. I love when you can immediately spot the meaningful items in an household. I also love your white furniture (am I the only one who thought that the zebra-chair was a no-go?). It just fits nicely together… and gives you the space to explore the full creativity that this place is meant to give you. I cant imagine all the tons of stuff you must have had in your hands. not to mention the uncountable plastic storage containers. I am glad you found such a joy in giving the excess stuff away, I can relate to that feeling. I prefer the white chair, too. But then, I generally don’t like black, but prefer light (or bright) colours, so that’s just my taste. I like contrasts, so I am happy with black or dark furniture. Walls need to be white (or really bright) though. But animal-fur-prints are just never elegant, imho. That Zebra chair was my daughters dest chair, then it ended up in my craft room and now it is in my son’s room. It sure has done the rounds. I like the white chair better because it is high enough for the desk. I bided my time on getting that because I really wanted to pick one up secondhand. This one however was on its last chance, imperfect sale at a local furniture dealer at a very good price. Once it was in place I sent the other chair to Liam’s room and reclaimed the dining chair he was using. You are so right about how much stuff must have passed through my hands while decluttering that space. I must have rearranged it a half a dozen time in the process. I still haven’t got tired of looking at the end result. You are right about that Spendwisemon, even I was amazed when I looked back on the photos. Wow! Great job. Don’t you just love it? Ah, I’m getting there. I have this goal. I can see it in my mind. Now to just achieve it. Print a copy of that last photo and stick it on your wall near you craft area Deb, perhaps it will be inspiration. Good luck. I have a picture of what I want it to look like hanging already. I still have these 2 metal 6-drawer units that I want to get rid of but they have mostly Mom’s stuff in them. So as she goes through things I am hoping we can get rid of those units. 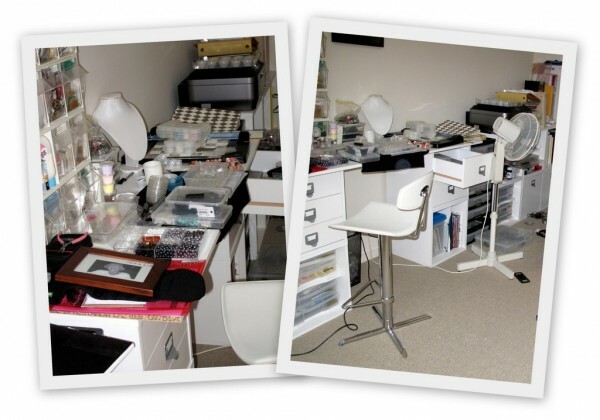 I’m kinda sad about the demise of the craft room because it shows that the creativity in crafts is gone too. I can’t see much crafting happening in that antiseptic craft room. I suppose the creativity comes out in other ways. I liked the original craft room, esp the zebra chair. Well, truth is, it’s your’s not mine! It doesn’t require a mess and a bunch of unused stuff to be creative. There is as much craft going on in that room now that it is uncluttered as there was when it was full of things I didn’t use. I loved the zebra chair, too!!! It provided a bit of ‘kick’, like ‘eye candy’. I would have left the zebra chair and changed out the brown photo frame for something in a ‘wowsa’ black/white (but not to overpower the photo!) to work w/ the zebra chair. That is only the decor of the place and that is only my thoughts. The room, overall, has achieved such an amazing level of transformation and to have such a lovely clear area to work in only makes creativity grow all the more!!! Overall, YAHOO Colleen! I love to see before-after! Thanks for sharing! Hi Annabelle, I don’t do wowsa frames because they don’t usually compliment the picture. The picture should always be the focus. I only wish you could see the photo better it is a photo of my mum in uproarious laughter, it is so her. She is a fun person to be around. (Bows respectfully). That’s an awesome transformation. I read this slowly, carefully comparing the before and “after a little decluttering”, making sure I don’t miss a decluttered storage box. But then, seeing the difference to the “end” state – I am stunned. I am stunned too Sanna, I don’t feel like I got rid of that much stuff. So clearly what went was neither loved nor used and already forgotten. Therefore it wasn’t necessary to my creativity or my pleasure. The joy the decluttered items bought to other people as they received them has also been a treat to experience. Some things sold and some donated to a local craft group, some items donated to a local school, storage items gladly bought and received by others organising their own space, the card making kit I assembled and I sent to my niece and nephew, items given to the lady at a local craft store to keep or share with her craft students, items sold at the thrift store I volunteer at… What a pleasure it has been. I was like you Sanna, thinking the after was the second lot of pictures, can you imagine my surprise when I got to the end! An amazing transformation! It really shows what steadily working away at decluttering can accomplish. It sure can Juhli, and the beauty of the slow approach was that nothing was given away or sold in haste. I was happy with each decision I made and have no regrets. That’s an amazing result, you must be really pleased. I, too, have had that moment where the progress sort of sneaks up on me even though I was there the whole time. But, oh..the bags. It keeps showing up on my radar nowadays even though they are pretty much out of the way. I have 9, and one weekend bag that serves as my suitcase (I’ve never owned luggage, so I don’t count the last bag, since others do not count luggage as a bag I’m pretty sure). I am “over” the bag thing, the last one I bought was simply because I needed a larger one for travel, and not for “looks”, which was a first. Even though I’m over it, though, still finding it hard to let them go, and I have no idea why. It’s not as if I regularly use them all. I think we cling on to things like your bags because it has become a habit in our minds that having that many makes sense and is the norm. People look at me like I have too heads when I say I don’t give gifts any more. It is the normal thing to do no matter how pointless the gesture ends up being when the person doesn’t want the thing you thought you were so clever in choosing. It is the same for owning things ~ All that china and crystal and trinkets ~ it’s what our parents held on to so it makes sense in our minds to own it even though we aren’t using it and it sits wasted. And then there is convenience ~ you buy one handbag and it isn’t quite perfect for your needs so you buy another which turns out also not to be perfect so another sneaks in. It would be a miracle if you found the perfect one so stop searching and consider how much stuff you put in there that you don’t really need (the just in case items). Oh what a vicious cycle. My current handbag ~ that I though was going to be perfect ~ turned out to be not so perfect after all but it is as close as any other I have owned so I will continue to use it until it breaks. In fact one of the zippers is already starting to fail on me (not impressed) so maybe that won’t be too far off. And lets not leave status symbols and fashion out of the equation yet another two pointless reasons for owning things that don’t really suit our needs. I think you are right about it being a habit–I’m sure that is part of it; it is one of my longest-standing habits. I wish I was one of those who could just stick to one bag until it falls apart, but I get “bored”. heh. Hi Faith I am glad you are just rotating the ones you have and not buying more. Every little thing we buy affects the environment in some way and that combined effect is harming our planet. I would suggest observing your use of the bags and if you notice there is one or two that get skipped in the rotation more than others perhaps they are the ones you could part with for now. This reply might end up in the wrong place…but yes, Colleen, I’ve finally got to that point where the guilt I would feel would greatly outweigh the excitement of buying a new bag. Husband definitely helped with that–he didn’t tell me what to do, per se, but made sure to give me lots of disappointed looks. heh. There is one that I know for sure I don’t use as much (3x a yr), and its handles are starting to tear off. May use it till its death. sometimes a little guilt is a healthy thing. It sure keeps me from purchasing things I don’t really need. Remembering how I used to be in the past keeps me behaving better now. I am glad I saw the error of my ways. You may only use that bag 3x a yr now but since you have managed to use it almost to death then it must have been well loved at one point. Good for you. Keep on using them and natural progression decluttering will take over eventually. Haha, that is so funny! And you’re right, of course. For the last 4 mths, I have gone down to one handbag, about 7″/18cm diameter, with a “rose” on the front. It’s bright burnt orange. Yup, crazy. But you wouldn’t believe how it goes with everything I own in some way (I am not an “all black” person!). It contains my cellphone, keys and a simple rose balm I use for everything oh and some mints. The inside pocket holds my various cards (not credit, but debit, ID, etc.) and the outer pocket holds my cash (and I slip my parking stub or vouchers whatever in there, too, while I’m out). I’ve found it’s all I need on a daily basis. Of my other bags (which are going out of the door any moment), I use only one that is larger and that is maybe 12″ wide, 8″ tall, anyway, it fits my ipad and enough for a 1-2 night stayover and a small pouch of knitting for on the train, perfect. I use it every other week or so. When I flew recently, I used the “6 items or less” idea for my luggage so only had one small carry-on – I was also taking a number of items for my mom (a mac, some pants, a pair of bulky shoes etc.) – in addition to my tiny handbag. Never travelled so peacefully before. Partly, I was inspired by thinking about what my grandparents would have packed in the 30s or 40s – a toothbrush, a bar of soap and a spare pair of knickers, probably! Hi MelD, I like this concept of “6 items or less” when travelling. Please tell me more. Seriously impressive.It looks such a restful space now Colleen. It is Katharine, I am itching to get up there and do something. Too bad I have been really busy this week and I have two books I want to read. WOW. You did a great job there Colleen! And I think it looks really inviting to sit down and do some crafting now. When crafting I sometimes find that having so (too) many supplies can be overwhelming and I spend a lot of time looking for things. I bet you know every item AND where it lives! Hunter_xs, I agree with you. I am finding it so much easier to know what to do when I don’t have so many scrapbooking supplies. I have to say that I still have a LOT of them but they are now specific. I have a drawer full of butterflies but they are all in one place now and I know that I will eventually use them because I love butterflies. I make a lot of greeting cards instead of buying them. I have things now that I know I will use. I kept only a few of them because I know that I will not want to use them on every card I make for a particular type of occasion. So while I still have a lot of stuff it is all now things I know I will use. I won’t have to go shopping for anything in the card making or scrapbooking line for years. I’ve consolidated from 36 drawers of stuff plus a madium sized cabinet to 18 drawers. These are 12X12 drawers that are either 1-in or 2-ins deep. As I use things up I will continue to consolidate until I have fewer drawers. It is funny you should say that about knowing where every items is ~ I have had some difficulty at times during the process of decluttering and rearranging because I would move stuff around so frequently that every time I would sit down to do something and I wouldn’t be able to remember where I put things. I am glad it is all done now so I can finally get accustomed to where everything is again. The pictures show that it is completely possible to “eat an elephant!” How to do it? One bite at a time. Congrats, your work encourages me to keep “eating” my elephant. Thanks. Nice analogy Rozann I will try to remember that one. The beauty of eating this elephant is that I only lost weight in the process. Well not me personally but my household contents did. That’s very impressive and you must have done a lot of letting go to achieve that. I do have this idea that to be creative, to feel creative, one must have clutter, which is why I’ve probably got too much myself. I too liked some of the original things – the zebra stripe seat and the things on the noticeboard. However the shelves of stuff – to get rid of them must have been a weight off your mind! I do know I can think more clearly if I clear up my space before I start working – getting rid of everything to do with the last project so I can think about the new one. But my space is more cluttered than yours. Must keep going! We all do what works for us Jane if clutter works for you then that is how you will keep things. I find the clutter just bogs me down no matter what area of my house it is in. With my craft room the guilt of all that wasted money on supplies I bought on a whim was stifling. Creativity is no excuse for having no boundaries. I had no problem justifying my craft gluttony at the time but now that I look back I know that I did far more purchasing than I did creating, although I did make some wonderful things. It is nice to have a certain amount of supplies on hand but one shouldn’t get carried away. The zebra chair did reach high enough to comfortably sit and work at the desk. The space probably looks a little sterile right now but that is because I am not working on anything. Well, I have to admit, I like a splash of colour as well, but then you can just pin a colourful picture or piece of fabric to that magnet board if you feel you need a little blue or red or pink or zebra to get in the creative flow. 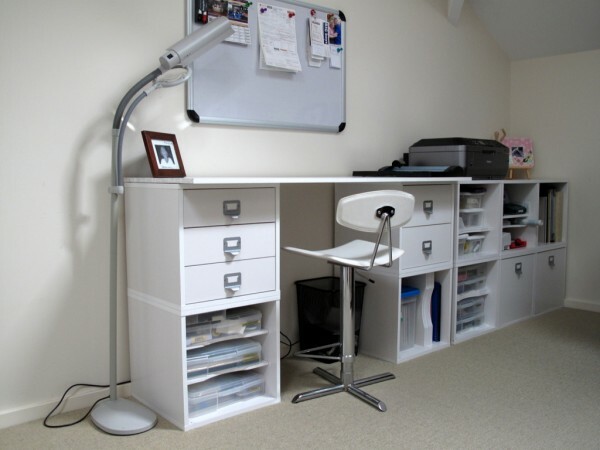 I love an uncluttered working space as well. My new little desk is now in a corner, one half facing the window, the other facing a blank wall and there’s nothing on it, just what I’m working with: at the moment a computer and a few books which I’m listing for sale, at another time my sewing machine or pen and paper or whatsoever. I’ve come to love versatile space. Your desk sounds like mine ~ always has things rotating. I think, I just entered that stage of “end of the tunnel” 😉 in terms of craft supplies and dishes. I find Sanna, it is inside the tunnel where you learn from your mistakes and the longer you are in there the better learned those lessons will be. So relish that part of the experience and don’t be too concerned about when you are finally going to reach the light. Wow !!! I love it – it looks clean and fresh and peaceful and I love Lena’s comment about creativity coming from inside anyway and all that space leaving room for active creativity.But also – craft is only one expression of your creativity -you are being creative in other ways at present such as with your blog – and we all get the benefit of that! Thanks Jez, I appreciate your kind words. And you are right it is now a peaceful space. Most of my creative thoughts pop into my head when I not at my desk anyway. I’ll just get random ideas while cleaning house or on my morning walk or while driving somewhere. So the idea has already formulated in my mind before I set to work at my desk which is where dexterity takes over. I have a stack of scarves, which get a lot of wear when I’m out of uniform, in this weather. I’ve noticed they’re also something other people like to play with/take etc, so there you go! And to me, more interest than a necklace (cause I only wear skinny little necklaces!) I feel like I can justify them all, as I can remember them all, even in my absence from them! The beauty of that nook is the each and everyone of the cubes are individual so I can configure them to fit the space I have. Because the ceiling slopes of in that area it is best to keep the level low. I can also set it up more vertically or even and a two deep island set up in the middle of a room if that is what works best. I have a friend who loves scarves too. She must be itching for winter to come every year. I find that because my clothes are quite intentionally limited chromatically I don’t need many colours to suit everything I own so am happy to limit them. Thanks Darling. I am so looking forward to your visit and meeting that boyfriend of yours. I hope he is as feisty as he sounds on the phone or he will never survive. 😉 Leave room in your bag for taking stuff home, you know the rules, if you come you declutter. Thanks Moni, it was a very gradual process, but I am pleased. I already have a piece of fabric out to make boomerang pillowcases for my son’s bedroom, some jewellery pieces to repair for the thrift store and some card making in mind. “Creativity is no excuse for having no boundaries. I had no problem justifying my craft gluttony at the time but now that I look back I know that I did far more purchasing than I did creating,” I will remember this one along with your pictures. This week I was thinking of the following quote and how it relates to decluttering, I think it works well. Wendy you are so right. What is it that they say, necessity is the mother of invention ~ well going without something often makes you realise you really didn’t need it in the first place. I so hope you hold out long enough to decide to get rid of the car altogether. We only have one car but both the men in the household have motorbikes which are far more fuel efficient but still cost a bundle to register and insure. Often when I am left with the car it doesn’t even get used and when it is in the shop for a service I either walk the few miles home when I drop it off or catch the bus. Now they have collaborative consumptions co-ops around like Go Get Car where you can become a member and hire out the car for a week or a day or a couple of hours for those times where you really need one. I would like to think I could get to that stage one day. I love the Go Get Car idea and I’m hoping that one day I can get involved in something like that. We use the car maybe 2 times a week other than Sunday and to me that says we don’t need one. I know we can catch a ride on Sunday’s if we want and I bet I could find a way to get to the other things too if needed. Mom is not so excited about that. For one thing it means planning ahead. What, Mom plan??!!! What’s planning??!! GRIN. Oh there is so much hope Karen. Good luck and I look forward to hearing about your joy when the job is finally done. When I got close to the finish line I had a sudden bust of decluttering ruthlessness and out went a bunch of stuff that had been lingering for too long. You will probably find that will happen to you ~ kind of like the light at the end of the tunnel syndrome. This is simply beautiful, Colleen. I love all the white – it’s very restful on the eyes. What a great result! I bet you sometimes sit in that new (to that place?) armchair and gleam with pride looking at your accomplishment and your new place and space. you are right I do enjoy a little declutter gloating. My bedroom leads right into the space and every time I come and go I enjoy the sight of the fruits of my labour. I LOVE it Colleen! I’m going to use your room as a model of how I’d like my craft area set up when we buy a house. perhaps your individuality and creativity is of a minimalist bent. I don’t suppose those interior designers ever gave that a thought. I hope you find a home to buy and can set it up just the way that is right for you. 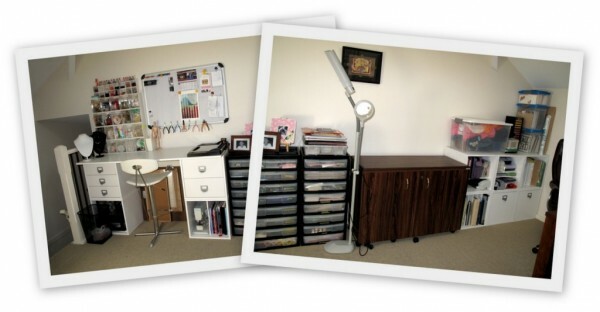 OH I love all the comments, and Colleen, the transformation of your craft area is HEAVENLY! I am a visual person too so I also love the before and after shots. I often forget in between what the original state looked like and with that craft space the transformation was certainly not small. Glad you like it and happy to hear you not only donated those containers but filled them up first. Well done. I love your lovely craft area too, Colleen…well done. If only my craft could be contained like that. I ‘do’ mosaics. Actually, I do more collecting of ‘stuff’ to mosaic with than anything. I love searching through ‘op’ shops and garage sales for interesting bits and pieces to mosaic with. Consequently, I have a STASH of ceramic tiles, plates, cups, glass baubles and other bits and pieces. A while ago our mini mission was to ask a family member what they would like us to declutter that day. Yes, you guessed it…my husband pointed to the mosaic areas (yes, areas)…but I have it in my head that I want to do the house more before I tackle the mosaic stuff. Some days it’s great…I’m on fire. Don’t stand in my way or you’ll be put in my despatch area. On the other days it’s terribly slow. I’m also doing the Project 333 and that has opened my eyes. I love that I have only a certain number of clothes to wear. Down-to-earth blog is another I’ve been following and I really feel it compliments this wonderful 365er blog which you are so wonderful to share with us. 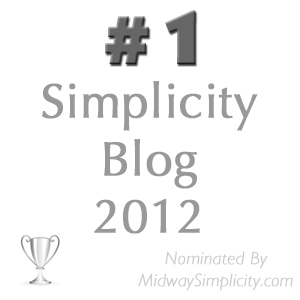 You may have heard of Rhonda Hetzel who blogs about simple living and thoughtful consuming. Your craft story sounds very familiar, the thrill of the hunt for supplies is almost more enjoyable than the craft itself. I would suggest to stop hunting for a while and concentrate on using up some stuff. That way you are decluttering without even trying. You can then stay focused on the areas you want to work on for now but still be making progress in the craft area anyway. Good luck and happy decuttering Sue D.
Clunk! That’s the sound of my jaw falling open with amazement. Good job Colleen!!!!! Thanks Cindy, even I was amazed when I looked back at the before shots. Well Done!!! I’m betting you’ll be so much more creative in your space. I dont mind that your response is slow as I know you have a lot of things to do and I appreciate that you responsed. As you invited me to give you a update her it is. I threw out all those chineses containers. Then brought a few backinside as I made a large batch of veg soup and did’nt have enough to put it in. I put it into a serve containers for my lunch. then yesterday I threw out the rest that I did’nt use. This felt great. And as you also said once you start– so on Saturday I did under my sink and also reorganise in logical manner and also threw out and gave away several items. When I do these cupboards it gives me a great deal of pleasure to reopen them every now and then just to see how clean and tidy they are,. today I tackled a job I had been putting off opening donation letters of my aunts who passed away in Feb this year. I spent 1/2 an hour ringing the organisations explaining who I was and why I was ringing. Most of them were very nice and gave me their condolences and thanked me for ringing to take her off their maling list. There was one who did’nt and I was suprised as this charity is a very well known one. This has made me feel very free and light. Today after reading one of Cindys newsletters about reason’s you know that you need to declutter made me feel very inspired and decided today was the day to start tidying up then clean if I have time but the tidying came first no matter what. I even opened my pantry cupboard and took off the notices I had on a magnetic sheet on the inside of the door. LOl I found raffle receipts the large ones from donations dating back to 2009. This is all cleared now with receipes in a folder where they belong. sorry this email has been long but just wanted to share it with you and show that you and Cindy always inspire someone on a day that they need it. Again many many thanks for your site, newsletters and support.